Like most things, many mouthwashes that you can buy at the store contain unhealthy ingredients that can be very damaging to your overall health. Store bought mouthwashes often contain sweeteners, color dyes and alcohol just to name a few. These store bought concoctions can wreak havoc with the pH of your mouth which affects, not only the health of your mouth, but of your entire body. "Keep out of reach of children. If more than used for rinsing is accidentally swallowed, get medical help or contact a Poison Control Center right away." Wow!! Something that needs a warning like that is not something that I want to be putting in my body!! 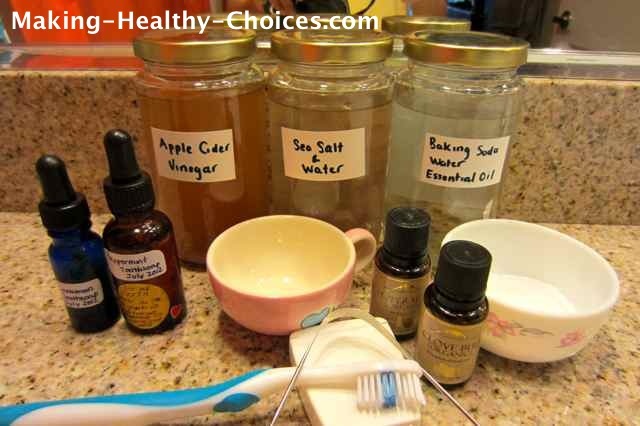 Instead of spending money on mouthwashes that are probably not even good for you, try some of these very simple homemade mouthwash recipes that will clean and freshen your mouth as well as keep you healthy. In a 10oz glass jar combine all ingredients and shake well. Before each use, shake jar to mix oil into liquid. This is a wonderfully refreshing mouthwash that is so healthy and cleansing for your mouth, teeth and gums. In a 10 oz glass jar combine sea salt and water. Keep jar next to your sink and swish around your mouth before and/or after brushing. This is a wonderful and simple mouth rinse that is so healthy. This mouthwash is perfect to use if you are having any mouth and/or throat issues (canker sores, sore throat, irritated gums) and is great to use after oil pulling. Make a tea from a nice healing herb and use that tea as a beautiful mouth rinse. To make your tea, steep about 1 tbsp of the herb of choice in 8oz hot water for about 20 minutes. Allow to cool before using as a mouthwash. Note that these teas will not last long. Make and use within a day or two.